Even if you are not the biggest car fanatic, you'll be well aware of the Jeep Wrangler. This vehicle has become a staple of American culture, and a symbol of freedom. 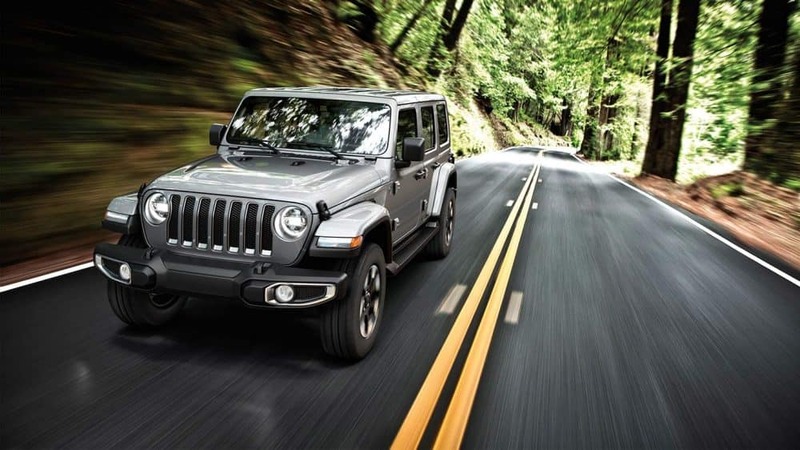 In the 2019 model year, the Wrangler continues to grow and transform with the addition of forward collision warning and adaptive cruise control. The major redesign happened in the previous model year, but you'll still find a rugged Jeep character, many customization options, and off-roading capabilities that the competition wishes it could keep up with. One of the most exciting aspects of this SUV is the trim lineup! Not only do you get two body types (two-door or four-door), there are also up to 5 trim levels available. Keep reading to learn more about each of them. Sport: This first trim does not skimp at all on standard features. You'll get technology like an 8-speaker sound system, a five-inch Uconnect touchscreen display, an auxiliary audio jack, a rearview camera, a USB port, and Bluetooth. Other standard features include fog lights, a tilt/telescoping steering wheel, a full-size spare tire, a one-piece folding rear seat, manual mirrors and locks, air conditioning, a driver information display, removable doors, 17-inch wheels, and a height-adjustable driver's seat that includes a 2-way lumbar adjustment. Sport S: Moving up through the trim lineup is Sport S. This model adds to the Sport's standard equipment with features like power windows and locking, vanity mirrors that come with the sun visors, heated power mirrors, a leather-wrapped steering wheel, alloy wheels, an alarm, and air conditioning. Sahara: The previous two trims were available on both body styles, while this trim is only offered with the four-door option. You'll find features like satellite radio, automatic climate control, a driver information display, an upgraded Uconnect system, 18-inch alloy wheels, painted exterior trim and body panels, a 7-inch touchscreen, an additional USB port, automatic headlights, Apple CarPlay and Android Auto, and a 115-volt outlet. The brakes have also been upgraded, and there is available full-time 4WD that comes with a lockable center differential. Moab: The limited edition trim is Moab! This model adds rear parking sensors, rock rails, a 9-speaker Alpine audio system, keyless entry, full-time 4WD system, blind-spot monitoring, navigation, special badging, a limited-slip differential, mud-terrain tires, unique black wheels, premium leather upholstery, an 8.4-inch Uconnect system, a steel front bumper, a body-colored hardtop, an auto-dimming rearview mirror, and LED exterior lighting. Rubicon: The final entry on this list is the most capable Wrangler around. This off-roading king comes with 17-inch alloy wheels, electronic front and rear lockable differentials, a heavy-duty Dana M210 front axle, a M220 rear axle, an electronically disconnecting front roll bar, an additional USB port, special off-road tires, 4.0-to-1 low-range gearing, upgraded cloth upholstery, shorter 4.10 axle gearing, and rock rails. There are a few other options you might be able to add to the trim levels. Stand-alone features include leather upholstery, remote start, a 9-speaker Alpine sound system, a heated steering wheel, and heated seats. All of the trims, save for Sport, are available with the Advanced Safety Group package. This package includes adaptive cruise control, and forward collision warning. For those of you who have fallen in love with a 2019 Wrangler trim, check out our inventory online! We have the best models available in stock, and we'd be more than happy to help you in the car buying process. Stop by our dealership today to see them all in person.